Hello, hello, hello! Welcome to the Mama Elephant Design Team Stampede! Have you been checking out the sneaks? The full release was revealed yesterday and they are already live on the Mama Elephant site}. 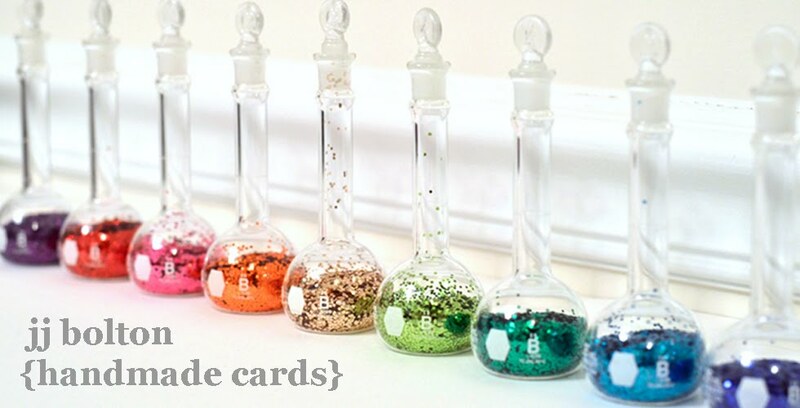 Today, I'm sharing a project using the new Make a Wish set! I used one of the awesome sentiments from the set as the focal point of the card.Don't you just love the lettering? The lettering is so beautiful and I love the oversized scale too! The balloons were made using the Party Kit dies and the panda is from Pandamonium (I added a little sideways grin on him;). For a different look, I colored the balloons with Copics instead of using colored card stock. I love how it turned out! That's it from me! Now before you finish stampeding, don't forget the giveaway! GIVEAWAY ALERT! To celebrate the new release, Mama Elephant is giving away one of each of the new stamps released! Winners will be chosen at random from the collective blogs in the Stampede. Winners will be announced on the blog on the last Stamp Highlights Day. You have up to 3 chances to qualify to win! Just leave a separate comment for each! love this! his sideways grin is adorable. Always love hopping around with ME! Excited for the new release as usual! liked on facebook as well. thanks for the giveaway! such a cute card.. I totally love it..
Eeek, OMG, I ♥ the panda's quirky smile. LOL! Oh, how cute!! The panda is so sweet! I adore the font in this set. Must have. Your panda card is adorable. that is just cute!! I like what you did with the balloons! A panda with balloons. So cute. And I love the sentiment stamp. How sweet is this. That panda bear is just adorable! I am liking how the font and sentiment takes centre stage in this card. I am DYING over that side-ways grin....genius, JJ! And I follow Mama Elephant on Twitter. Great card. I love the wry look on the panda's face. good idea to color the balloons rather than just use colored cs. that gives it a more polished look. So cute and the little panda smirk is fun. Coloring on balloons looks great! I am such a sucker for cool sentiment fonts! Love how you overlapped it on the balloons & that cute panda is my fave!!! So adorable , love this fun happy card!!! Love the panda with the balloons! Genius stamping the sentiment over the balloons. Darling card. Love the font of that stamp and your card! Cute card! I absolutely LOVE these new hand lettered sentiments! GORGEOUS! I LOVE this!! The balloons add such a nice pop of color. Very cute and fun card. This card is SO cute! I love that panda and the colorful balloons! OH isn't that darling!? I love that little bear! This card makes me go...: "Aw... Totally fun and creative, JJ! Love how you did the balloons -- that sentiment is good for lots of occasions! So darn cute. I'm not normally into animals, but this guy and the bunnies and birdies are so dang cute. I have the hardest time with lining up those stamped twice and die cut designs. Yours looks poifect. Love the panda...so cute..colors are very pretty!! The panda holding the balloons is so cute! I think everyone loves these sentiments--I love how bold and scripty they are! Gorgeous card--thanks for sharing! Awww!!! Your card is super cute!!! Love your Panda and balloons! Bright, happy and simple. Love , love , love the card !! I love how you played with this stamp, JJ! 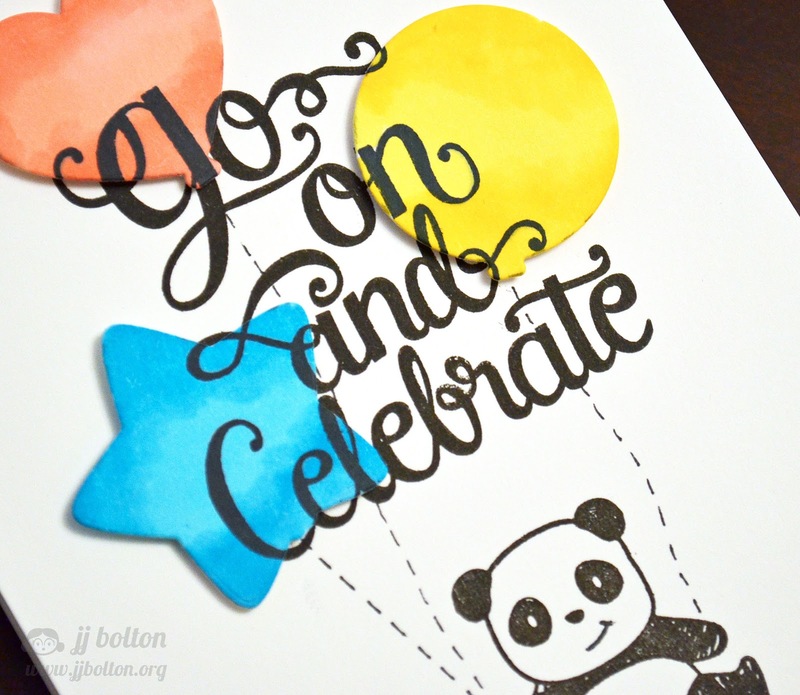 What a great idea to use the Panda and those fun balloons...such a cute card! Beautiful layered stamping...those balloon dies are so cute. I love the balloons - very dimensional card! Love your sweet card with that fab sentiment & the cute panda! I follow ME on Twitter & tweeted. That smiley face is adorable~~ :) love the colored balloons, as well! I love the look of the popped up balloons aligned with the sentiment! Genius! Thiscard isso cute.cant wait for the release. I follow thru Feedly . Gorgeous card love the 3d look of the balloons. super cute. Such a cute card. Love the dimension. You always do such nice projects and are truly an inspiration. Oh my, I am totally digging that grin! He looks so pleased with himself! Great card JJ! I LOVE your card! The balloons and the panda are so cute! I like the panda's smile and the stamping on the balloons. What an adorable card. It's very happy. I love this card! His little side grin is the best! Adorable card! This stamp set is really awesome! eek! love, love, love the panda! Great card! I follow mama elephant on twitter. Super cute! Love the addition to the panda face and your diecut layering technique! Very cute, love the colouring on the balloons. What a cute card. The pans is adorable . Cute Card. I love how Mama Elephant stamp sets work together so well. I love the script stamp. I still love that panda! Cute card! Darling card! Great sentiment stamp and sweet panda! Love that fun sentiment! Fabulous card, JJ. Love the dimensional stamping. Love your card! 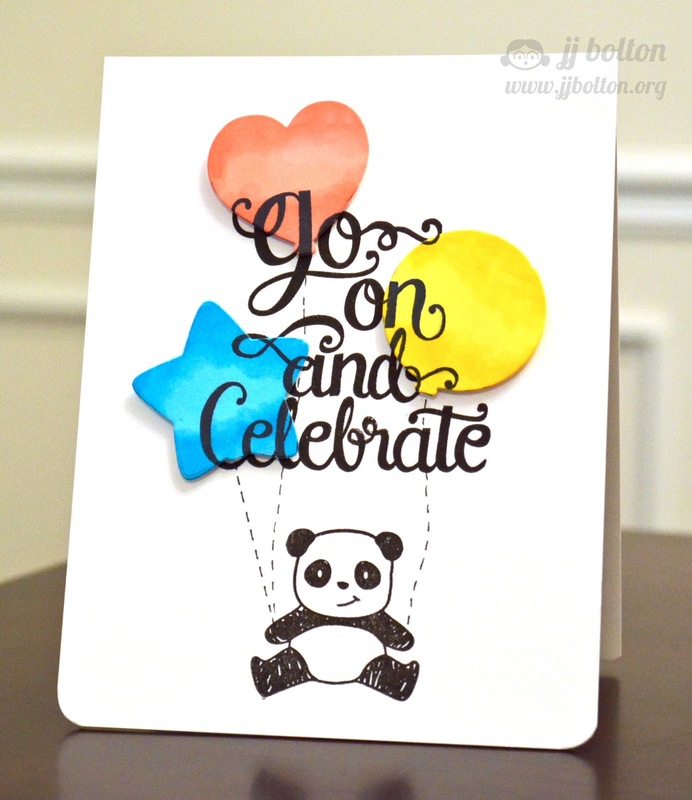 The panda is darling with the balloons, and the sentiment is great for many occasions! Great job! I love the panda stamp, so cute. Great card. Too cute. Great combo of stamp sets! So very cute. Love the panda. I absolutely adore this card!!! Love the bold, crisp look of your card. Liked and shared Mama Elephant on Facebook. Following Mama Elephant on Twitter. I love the way you did your stamping wth the raised balloons. Really cool! Great effect with the layers! Fun Card! Love Pandamonium! And this new sentiment is so great and big!! You used some of my favorites from ME. These new sentiments are so amazing. So cute and festive - Love the stamp set!!! This card is just darling! Love that font! This card makes me happy! Thanks for sharing! Love how you stamped on the die cuts. Very cool. Awesome! Love the layered stamping! OMG !!! You're card is so cute !!! And I like ME on Facebook too. Aww!!!! That sideways grin is soooo adorable!!!! I've that some of the sentiment is stamped over the balloons too! Awesome!! What a perfect card!! Love your cards!! So Sweet! Love it. I follow on facebook to! Too cute! Such a happy panda card. Love the new sentiment! What an adorable card, the panda is too cute for words. Love this stamping trick--really cool with the balloons and the great sentiment. Great card! Love the panda with balloons and how you stamped the sentiment! Fabulous! Awe this card is adorable I love balloons and of course that panda is just the cutest!it. I'm going to steal a favourite word from Tenia..."lurve'! what a fun card for kids! How adorable is this card!!!! Yes, I do - love the lettering! Great card! Very clever stamping and the panda is so adorable!! Love the cheeky smile on the panda...so cute! So cute! I love this technique and love that you colored the balloons with copics. That expression on the panda's face is kind of cracking me up too! So cute! I love the panda! I love the way you created a 3d effect with the balloons. So cute! So cute! Thanks for the opportunity. I follow ME on FB. I think these sentiments & fonts are one of the best things about these Mama Elephant stamps! Thanks for sharing! ok your card is a whole lot of CAS complicated! I don't know how you make CAS seem complicated and technical but you do and it is amazing every time! So cute! Who doesn't love a panda? Such cute colored balloons. Love the new goods! The quirky smile is so cute and love the idea of different shaped balloons. That sentiment rocks! OMG Adorable and so clever. I think I need this set now!